Cardiovascular disease in severe cases can be complicated by cardiosclerosis. With this pathology, the sprouting of the connective tissue occurs, due to which the cardiac activity is disturbed. The course of the disease is not easy, so it is important to get on time and recommend treatment by the doctor. Cardioclerosis (COP) is a myocardial pathology, in which scar tissue is formed inside the heart muscle. As a result, the number of cardiomyocytes is reduced, and the valves gradually deform, which leads to stenosis or insufficiency. The development of cardiosclerosis occurs on the background of other cardiovascular diseases (coronary heart disease, myocarditis, atherosclerotic lesions of the coronary vessels). A full examination of the patient is mandatory and in case of revealing of typical signs of cardiosclerosis appropriate therapy is prescribed. The disease is divided into several clinical forms, each of which is subject to a specific treatment scheme. If the medication correction is not performed, then the risk of dilatation of the heart increases and in the future - heart failure. Atherosclerosis - affects vessels of different caliber and location, including in the heart, which leads to deterioration of hemodynamics, necrosis of the cardiac tissue and activation of the scarring process. Ischemic illness - as a rule, follows after atherosclerosis and exacerbates the previously disturbed work of the heart. Increases the area of myocardial damage, as a result of which cardiosclerosis also becomes more extensive. Myocardial infarction - characterized by the dying of a certain part of the cardiomyocytes, in which place the scar is formed. Myocarditis - refers to inflammatory diseases, during which the myocardium is often infected, followed by the replacement of inflammatory and destructive parts of the scar tissue. Hypertension - in the severe stage of development causes dystrophy, destruction and sclerosis of the areas of myocardium, which did not withstand overload due to high blood pressure. 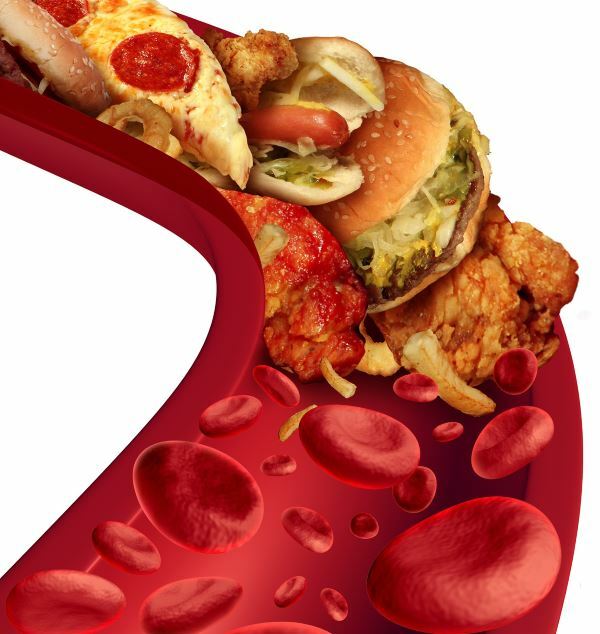 Diabetes mellitus - leads to oxygen starvation due to damage to small vessels, on the background of which cardiomyocytes also collapse and are replaced by connective tissue. Pathological conditions associated with hypotrophy, tracheal processes, dilatation also lead to malnutrition in cardiomyocytes, which is why they die, and connective tissue develops in their place. Insufficient performance of physical loads. The presence of bad habits in the form of smoking and alcohol consumption. Incorrect nutrition based on the intake of greasy, smoked, salty, spicy foods. Such risk factors are at the heart of the annual increase in the number of patients on cardiovascular disease, which ultimately lead to cardiosclerosis and heart failure. Dystrophic changes - characterized by a myocardial malabsorption, due to previously developed heart disease, such as atherosclerosis, cardiomyopathy, myocardial dystrophy or chronic ischemia. Most often it contributes to the development of diffuse cardiosclerosis. Necrotic processes - expressed in the necromancy of cardiac tissue, which mainly occurs during heart attack, injuries, injuries made during the operation. May cause focal cardiosclerosis. Inflammation of the myocardium - is formed during the development of rheumatism, infectious myocarditis, which leads to the formation of focal or diffuse cardiosclerosis. The presence in the history of life of diseases that can cause cardiosclerosis, relates the patient to a risk group. Therefore, even in the case of a complete cure for the underlying disease, signs of COP may eventually manifest. A diffuse COP can spread throughout the myocardium, or occupy some part of it. At the same time, there are no clear boundaries of pathological education. In its development, diffuse cardiosclerosis resembles a cellular structure that includes islets of normal cardiac muscle. 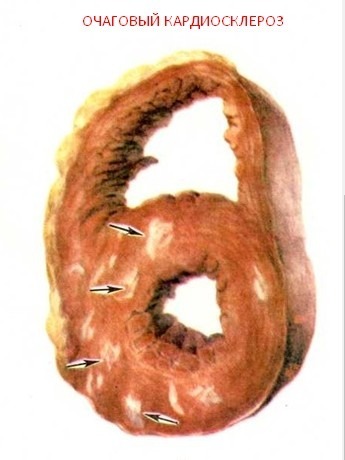 Gradually healthy areas decrease in size, but at the same time, they do not completely replace the connective tissue. Scar formation is not able to be reduced and it is formed on the basis of destroyed cardiomyocytes. Focal COP is a limited area of the scar tissue with clear borders, which, like the diffuse cardiosclerosis, forms on the site of the dead heart tissue. More often, such an education is characterized as a scar on the heart. It lacks cardiomyocytes, so it is not able to contract and very weakly transmits impulses. 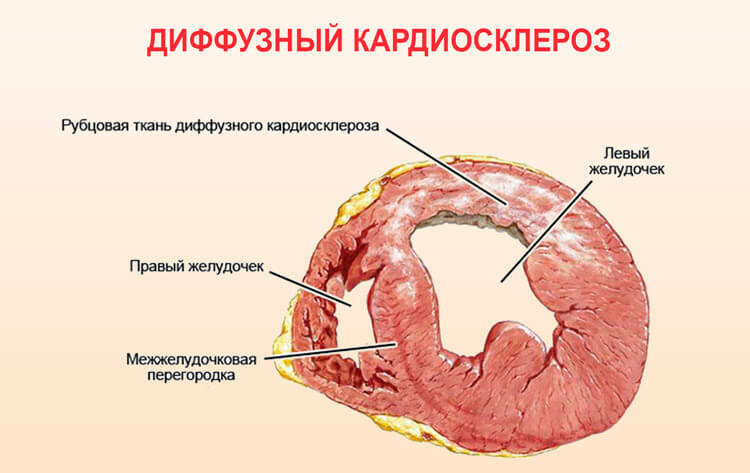 This site is necessary only for one - to connect the remaining healthy parts of the myocardium. Depth of defeat - often depends on the size of the previous myocardial infarction. If it was superficial, then the focal COP is determined on a small plot. Transmural myocardial infarction leads to deeply penetrating cardiosclerosis. The dimensions of the defeat - the COP can be small-focal and large-focal. The defeat of the myocardium on a large area causes a serious clinic, and small, precise formations do not often interfere with cardiac activity. Localization of the focal point - the scarring on the wall of the left ventricle is less favorable than the similar inclusion in the interventricular septum or on the atrial wall. The number of foci - the more scar tissue in the myocardium, the harder it will be harder to contract the heart, therefore in such cases the risk of complications increases. In view of the fact that the characteristic of focal cardiosclerosis is extremely important in determining the course of the disease, the most accurate diagnosis should be used. 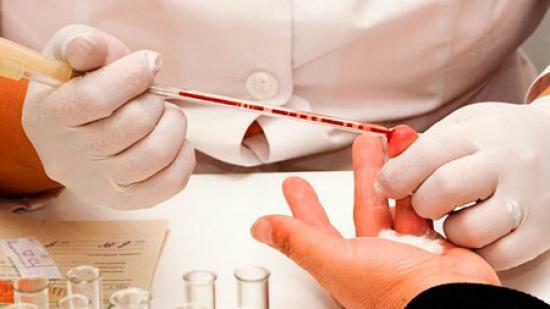 This makes it possible to predict the "behavior" of the disease. Almost 50% of patients do not have signs of cardiosclerosis, therefore, many believe that the disease most often does not threaten the patient. In fact, the clinic may not be strongly expressed, and the pathology thus progresses and in severe cases leads to heart failure. Cardiosclerosis can be hidden, so in such cases, the characteristic symptoms of the disease are not determined. Pain in the cardiac region is most often determined in those cases where cardiosclerosis develops against a background of disturbed coronary circulation (with ischemic disease, atherosclerosis or after myocardial infarction). Tachycardia is manifested by an increase in the frequency of heart attacks (more than 90 beats / min), which can be observed after exercise, and in a calm condition. Increase in myocardium - regardless of the root cause, mainly develops in the case of focal and diffuse COP of severe course. Arrhythmia - as a result of disturbances in the functioning of the conducting system of the heart there are interruptions in its work, which manifest themselves as a sensation of cardiac arrest, dizziness, weakness, fainting and pre-anxious conditions. 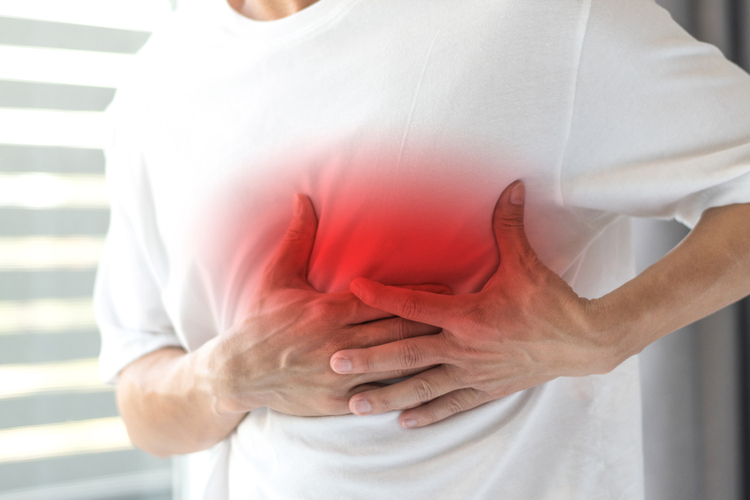 Inadequate cardiac activity - its symptoms begin to manifest in severe cases, when decompensation of the heart works, resulting in shortness of breath, swelling, cough, weakness, and tolerance to physical activity. 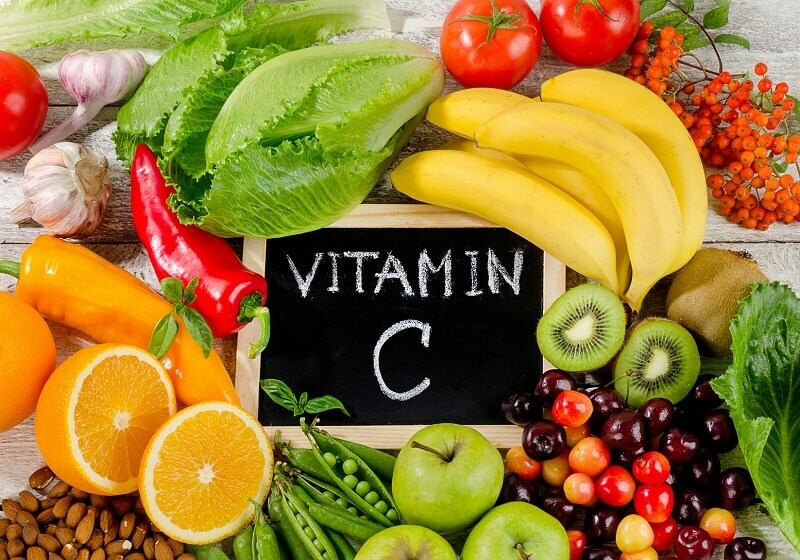 Depending on the predisposition and the underlying disease, on the background of which the COP developed, additional symptoms may arise in the form of elevated blood pressure, pulmonary edema, enlarged liver. Signs appear gradually, which in some way characterizes the activity of the course of cardiosclerosis. First of all the patient is examined, his anamnesis of life, illnesses are determined, complaints are also specified. Listening to the heart allows you to determine the rhythm disturbance, measuring the blood pressure - increasing or lowering it. Electrocardiography - evaluates heart abilities such as automatism, excitability, conductivity. Echocardiography (ultrasound of the heart) - determines the pumping function of the heart, the size of its parts, contractile capacity. X-ray of OGK-enlargement of the chambers of the heart can be reflected in the pictures. Scintigraphy - are done to assess vascular passage, especially if there are suspicions of a coronary heart disease. Tomography, computer or magnetic resonance. Laboratory diagnostics in the form of general and biochemical analysis of blood, lipid profile, etc. It is important to remember that the more qualitative the diagnosis is performed, the more accurately the diagnosis will be established. As a result, this will give an opportunity to conduct effective therapy. The formation of scar tissue in the heart is essentially an irreversible process, so an absolute cure for cardiosclerosis is impossible today. For this reason, patients on the COP should mainly take medications until the end of their lives. assisting the patient in improving the quality of life. Depending on the condition of the patient and the presence of direct indications, surgical treatment or conservative treatment may be used. In some cases, these two methods of therapy are combined. It is also important to observe the diet and organize the right lifestyle. The final decision on prognostic conclusion is taken after careful examination of the patient. If there are no pronounced complaints and the disease is susceptible to medical treatment, then a relatively favorable prognosis may be given. This is more likely to happen with single small-basal cardiosclerosis. The large-centered COP, as well as the diffuse variety of the disease, is in most cases prognostically unfavorable. If the connective tissue was formed at the site of a transmural infarction, then the risk of aneurysm of the heart increases, which entails severe consequences. In addition, in the context of large-center cardiosclerosis, severe forms of arrhythmia often develop, which makes the prognosis unfavorable. Stop smoking as this bad habit leads the heart to oxygen starvation. It is timely to conduct examinations at the cardiologist and, if necessary, doctors of related specialties.